A great message center and way to stay organized. 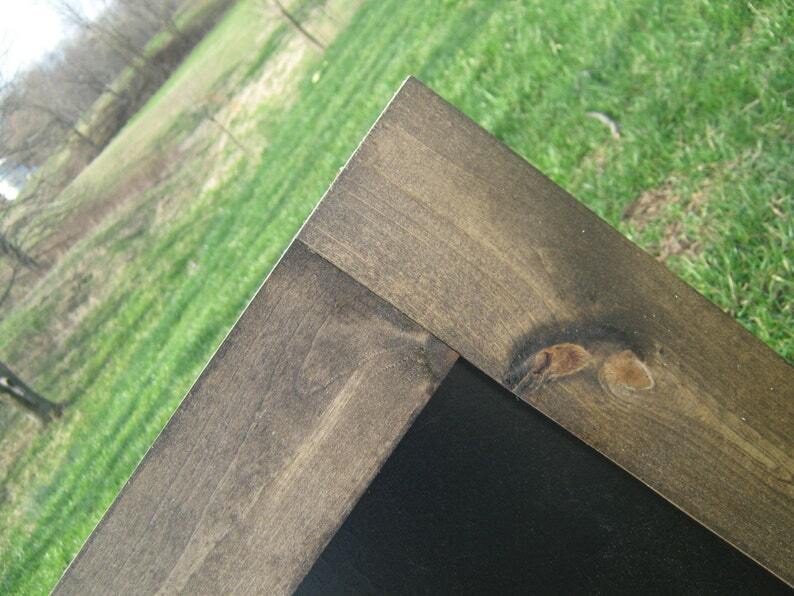 This chalkboard is stained in your choice of Dark Walnut, Early American, Driftwood or Ebony. It is available in many sizes, just choose from the dropdown menu. Dimensions are for the inside chalkboard space. The frame is 3 1/2 inches thick. The size in the photos is 16 x 20. Chalkboard comes ready to hang horizontally. If you would like to hang vertically please send me a message at checkout. Can customize to other stain colors, just send me a message and I will do my best to match it. Please also message me with any questions you may have. Can use both regular chalk and chalk markers. Works great outside our pantry to write our shopping list on! We accept Paypal and credit cards through Etsy direct checkout. We also accept Etsy gift cards. I want you to be happy with your item. I will accept refund or exchanges within 5 days of delivery on non custom items. Unfortunately I am not able to refund custom items unless it was a mistake on my part. I send out approval photos on all of my custom items to make sure everything is great before it gets shipped. I strive for customer satisfaction, so please let me know if there is something I can change before your item gets shipped. Once your item is shipped you are responsible to ship it back it to me for a refund. I will not give the refund until I have received the item unless the mistake was made on my part. Thank you for understanding. We normally use UPS ground for our larger items and USPS for the smaller ones. UPS ground is normally 2-4 days from the time we drop off your package. We use ground because it gives the best rate for the weight and size of your package. Please keep in mind ground does not ship out on Saturdays. We will drop off your item at the facility 6 days a week, but it might not ship that same day. This is how we keep the shipping rates lower. If you need an item quickly let me know and I can check other shipping rates to get it to you faster. There is also a chance that the rate could be higher depending where you are located. Also the price for shipping includes your box and other shipping supplies needed to package your item. Every item we ship is carefully wrapped and has to be put in a proper sized box. We do not want your item arriving broken and you to be disappointed so please keep that in mind when looking at shipping cost. Your item is insured when shipped. If something does happen in transit with some unruly shippers it is important to let me know within 3 days of receiving the package. I can turn in a claim for your item that is damaged, but it has to be done in a timely manner. It is also important to keep everything intact the box and the broken items. Thank you for stopping by our shop and we look forward to creating an incredible piece just for you!